Cycling is a very popular sport in South Africa enjoyed by very many people, but it is a potentially dangerous sport. When participating in organised events, the wearing of bicycle helmets is compulsory. “No helmet, No ride” is the motto of the organisers. When cycling casually, the wearing of bicycle helmets is encouraged. In South Africa, we do have an exceptional volume of traffic on our roads. Only recently are the authorities adding “cycling lanes” to the road system. Funds from the Roads Department are very limited so this process will take time. Cyclists are not allowed to cycle on our Freeways (Motorways). We do have a Pedal Power Association in South Africa (PPA) who arrange organised cycle rides both off-road and on-road. There are road marshals in attendance warning cars that bicycles are using the road for an event in progress. In order to increase “Bicycle Safety”, PPA have recently had a law passed enforcing cars to leave a distance of 1.5 metres between the cyclist and the car (or any motorised vehicle) when passing. Cycle shirts (pictured) have been made and are sold to cyclists by our PPA at a reduced cost. Bumper stickers are also available. Congratulations to Elaine on the arrival of her fourth grandchild: her younger son and his wife had a little boy in May. She writes that he has a mop of dark hair and is so beautiful. Now she has 4 grandchildren: 2 girls and 2 boys. Planned that well, didn't they? “We would like a full report please”. These words were contained in an e-mail sent to me by a Very Distinguished Member to whom I had written, telling him that Anne and I had spent most of the voucher for £100 which had so generously been given to me by members of the Association at the Presentation Dinner during the Torquay Weekend in January. To all of you, I would like to repeat my sincere thanks for this handsome gift. It was totally unexpected and most kind. We bought two tickets for a concert in the Royal Festival Hall on the 8th April. Anne and I go to so many recitals, usually piano or instrumental, at lunchtime at a variety of venues in London – the Royal Academy of Music, the LSE (both during term time), St. Lawrence Jewry plus other churches in the City, where we are fortunate enough to listen to highly talented students or mature musicians, often of international renown, that, by way of a change, we decided to forsake the warmth and intimacy of these familiar places for a full blooded orchestral concert in the Festival Hall. We had not been there for a concert for about 30 years (though when we do a South Bank walk from Westminster to the City most Mondays, we usually call in there for a brief pit stop). My heyday goes back to the mid - late 1950s when, with a group of my pals, I used to go there regularly. I was an articled clerk in an office in Norfolk Street which ran from the Strand to the Embankment (Norfolk Street no longer exists), so it was easy for me to nip over Waterloo Bridge in my lunch hour and buy tickets. This was at the time Klemperer and the Philharmonia reigned supreme, Josef Krips conducted the LSO in a Beethoven cycle, an annual Hoffnung concert always sold out, Geraint Jones and others gave early evening organ recitals, I once saw Dr. Albert Schweitzer in the audience and Von Karajan conducted with his eyes closed throughout – I know this because in the evening of the last day of my finals in November1958 we sat in the orchestra stalls and listened to/watched him conducting a thrilling performance of Bartok’s concerto for orchestra, never once looking at the members of the orchestra or, apparently, the score! Quite extraordinary. I believe tickets were about 5/- at the time; a bit different from today’s prices; ours were £38 each! So back to the 8th April which happened to be a beautifully fine and warm evening. We arrived in plenty of time for a drink before taking our seats in the centre of the stalls; perfect. The dress code has certainly changed in the last 30 years. In the 1980s most of the audience dressed up and the men wore suits and ties. Now, more or less anything goes – but where is this not the case today? However, the enthusiasm was as keen as ever and as the auditorium filled to capacity, the buzz of expectation palpably increased. Hardly surprising with the appearance of the prestigious Orchestra of the Age of Enlightenment (the majority of whom were women including the leader of the second violins who is head of the Historical Performance department at the Royal Academy and has the wonderful name, Margaret Faultless) playing period instruments and conducted by the highly esteemed Semyon Bychkov which raised this above the level of a routine concert; it was an occasion. They performed Beethoven’s 7th and Schubert’s 9th symphonies (the Schubert being particularly close to my heart), and, as you might expect, were rapturously applauded. We could not have chosen a more uplifting programme which was broadcast live on Radio 3. Did anybody hear it? It was definitely one of the highlights of our musical year so far. Thanks to all of you, it was a memorably enjoyable evening…. And we still have £24 of the voucher left! As there is no expiry date, we shall take our time…….but who knows? I might do another write up before the year is out! 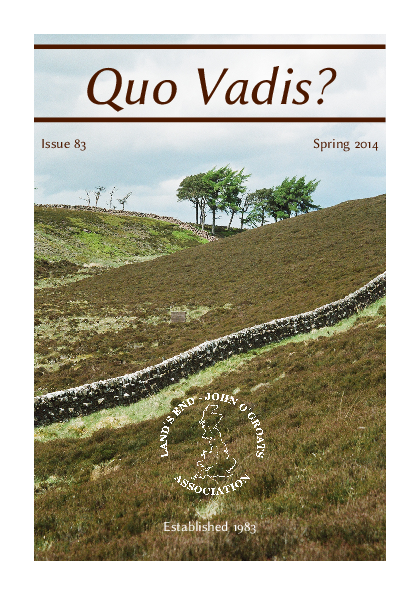 In 2012 I think there was an Olympic Torch Relay article in Quo Vadis? which featured a few End-to-Enders who carried the Torch when it was relayed from Land's End to John o'Groats as part of the world's longest relay. I was wondering if we were doing something similar with End-to-Enders who carried the Queens Baton for this year's Commonwealth Games? Once more I had the privilege and the honour to do just that as the Baton came through Dumfries and Galloway on the 19th June 2014. How many of us End-to-Enders have done both, or is it just me? I would be interested in finding out. I met Harry in the local pool and although I have been a swimmer for years I had no idea that I had the potential he saw in me. He used his expertise to help me to train for 3 years to achieve an unbelievable goal: for my 50th birthday I swam from Ailsa Craig to Girvan beach which is about 11 miles but ended up being 17.5 miles due to adverse tides. Harry was beside me the whole way in a fishing boat. Harry stood on the beach for hours in all weathers while I trained sending me signals and encouragement. In his sea kayak he was by my side as we tackled challenging training swims. I raised over £13,000 for Alzheimer Scotland by listening to his endless ideas about fundraising to which he is no stranger. Harry is a community activist and an inspirational athlete; he challenges himself and others to events and activities. Last year he completed the 10 Tors challenge on Dartmoor as part of a team of men who were the first boys to tackle the challenge in their teens. Fearless and determined, Harry inspires me to be the best and to achieve what seems out of reach. He's a loyal and loving friend; I can't think of anyone more deserving to be part of the greatest sporting event in the world. Congratulations to Harry for both of his relays - what a lovely event to be a part of! Were any others of our Members Bearers of the Queen's Baton this year? 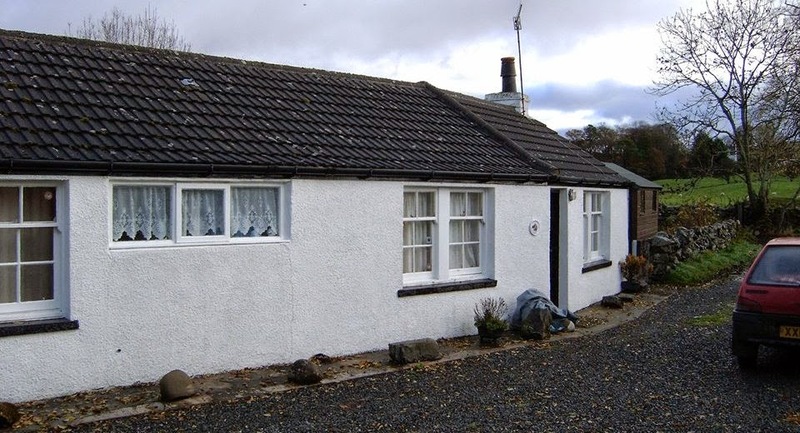 Here are a couple of cottages that I am letting out in South-West Scotland. The village is called New Luce. I have hosted 3 End-to-Enders this year to date. There’s free bed and breakfast for those who are daft/brave enough to include S.W. Scotland in their Journey North or South. Contact me for availability - I am often away doing my own mad things. Have fun all you crazy people! Have I always walked long distances? No. 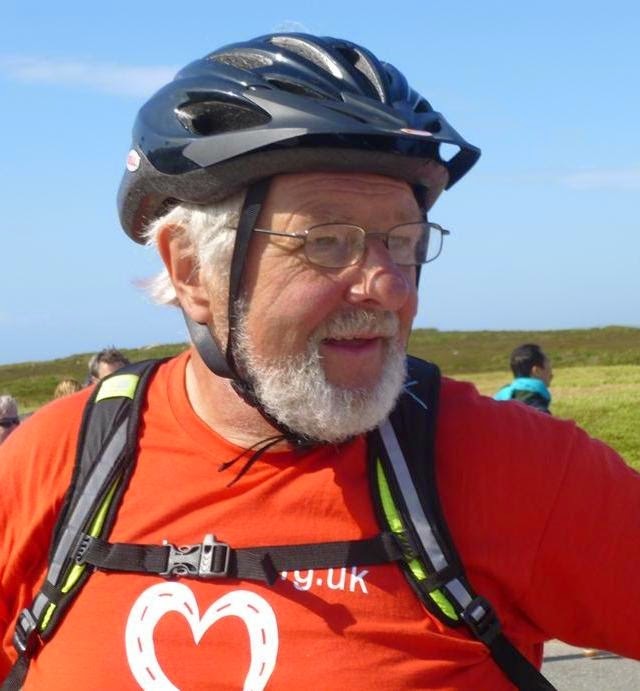 My very first long-distance walk was from John O’Groats to Land’s End, and it was to celebrate my 60th birthday (which I celebrated at Camelford just two days from Land’s End) and was in response to an article which appeared in the Saga Magazine. In this article David White invited Saga readers to help prove that the over 50s are not short of energy, commitment or discipline. His article concluded with these words: “Even though, in others’ opinion, I suffer from all the ailments of age, I intend to walk from one end of Britain to the other and gather some of my peers en route.” He was very disappointed that no-one joined him! Whilst not agreeing with all his sentiments, it inspired me to have a go. I completed 1,000 miles’ training on Dartmoor. At the conclusion of the training I knew that my body wouldn’t let me down. At the last group I spoke to I was introduced as “a serious long-distance walker.” Personally I do not see myself as a serious walker, for that title belongs to those who complete the LEJOG walk entirely off road, usually along national trails, across moorlands and on canal towpaths, etc. I covered the walk almost entirely on tarmac so that Margaret (my wife) could drop me off and pick me up at an agreed location each day. I found the experience very exciting because I could enjoy the scenery, whilst filling my mind with unusual street names, odd street notices like “Caution – heavy plant crossing,” and meet lots of people. Some stopped and chatted, some wanted to know all about the walk (and the Association) and a few just said hello. Vehicle drivers flashed their lights, blew their horns and cheered me on my way. Every layby café offered me a drink and food at no cost (I always accepted a mug of tea but declined the food offer). I sang almost all the way and once, having sung whilst walking along with a lady, was introduced to her friend as “the singing walker”. I was asked for my autograph, and received a number of gifts for my chosen charity. I also met a number of cyclists who passed me on their way to John O’Groats. 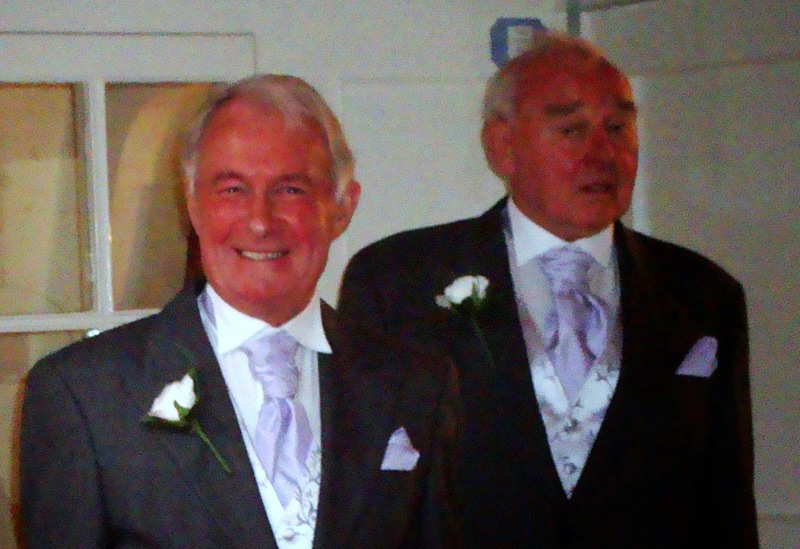 They were always very encouraging, expressing their surprise that I was walking on average 23 miles a day and left me with the words “See you at JOG” to which I always replied, “Not at my pace you won’t”. I think I would have missed all this if I had been a “serious walker” off road. My answer to the question, “Where will your next long distance walk be?” depended on when the question was raised. Since my two walks recorded by the Association, I have walked 4,000 miles round the coast of Britain (over a period of 6 Mays and 6 Septembers), twice walked The West Highland Way (the second time walking with Margaret), spent two weeks on the Isle of Arran, and walked the Offa’s Dyke Path. I am not a serious long-distance walker; I am a fun walker and will continue to walk until I no longer find it pleasurable as well as challenging. This May I completed Wainwright’s Coast to Coast walk from St Bees to Robin Hood’s Bay. It was not "a piece of cake" as was expected by some. I found it very strenuous at times; every day was different - in terrain, in gradients, in wildlife, and in the number of fellow walkers I met. I was nicknamed the sprinter, the fast old man, the marathon chaser and other names I couldn't repeat but they were all very good-natured comments/titles and Margaret was praised very highly for her part in my solo walk. I had one or two days when there was a threat of a shower or two and I always carried my mac in my rucksack just in case. One day I had a very long and heavy drizzle when I was between Rosthwaite and Grasmere – walking from cairn to cairn before the descent into the valley leading to Grasmere. The stone steps up from Rosthwaite were all wet with a stream running down them, as was the descent into the valley leading to Grasmere. The only other rain was as I left the woodland on the approach to Richmond. I already had my waterproof trousers on and quickly put on my mac. In seconds the heavens opened and the next twenty minutes was a real soaker. By the time I reached the Tourist Information Centre, where I was due to meet Margaret, the road and pavement were awash with water, not just a stream but a river, with it coming halfway up my boots! Whilst I waited for Margaret – I phoned her and she was just a few doors away in a café – the rain turned to hail resulting in a heavy covering on the roads and pavement which looked like snow but was very slippery. The Black Sail YHA Hut (midway between Ennerdale Bridge and Rosthwaite) has obviously had a very recent, good make-over. It was occupied by two couples also doing the C2C walk and they were having their packed lunch whilst sheltering from a very blustery wind. There was a land-rover parked at the side of the hostel but no sign of a warden! I was a bit concerned that I might lose my way crossing the Lake District because there were no C2C way markers and I cannot read a compass. However, I had Martin Wainwright’s book “The Coast to Coast Walk” which included a map of each section plus a detailed description of the route. Walking from Patterdale to Shap I stopped to eat my lunch at the point where I could see The High Street (the roman road) continuing directly in front of me and the path leading to Kidsty Pike on my left. A number of walkers went straight passed me and would have walked straight ahead and joined The High Street. I told them that I thought they needed to turn left if they were heading for Kidsty Pike and Shap. One group were walking using the Ordnance Survey maps, another group were using GPS(?) and others were using Wainwright’s book. It took a lot of persuading for them to turn left but I passed them all later and they were very grateful to me for my advice. Proof, if any was needed, that my book was the most reliable and saved me from any further worry. I nearly lost my way after negotiating the steep climb out of Grosmont. My book said “look out for a cattle grid, walk straight ahead where the road bears off to the left and be careful crossing the main road and walking down to Hawsker”. Well, I crossed a cattle grid and looked at my map which showed a footpath immediately going right and another going directly left and up to a disused quarry, but the path and road continued straight ahead. It took me a long time and effort to find the right path (after a couple of attempts walking across the heathland) but I finally did after I crossed a second cattle grid which was not shown on my map. This was the only time I was let down by my book. Most of the other walkers I met – and passed - were also walking just with day packs, having their luggage transported by “Sherpa”, “Packhorse”, or by supporters like Margaret. Of the dozens of walkers, I only met 4 men who had huge rucksacks on their backs. None of my fellow walkers envied me my speed but they almost all envied me having my wife support me in the car and, when they met her at one of the various Hostels or B&Bs, told her so. I completed every day’s walk within minutes of the time suggested in my book which worked out at 2 mph each day except for the two 18 miles stretches when we were expected to walk at 3 mph, which wasn’t easy. A Dutch man caught up with me as I sat and ate a banana and had a drink having walked up the steep road from Kirkby Stephen and heading for Keld. He was convinced that I was a local man, used to walking in the Lake District because “you always look so relaxed and make the climbs look easy”. I had remembered to pick up a pebble at St Bees, and I threw it into the sea at Robin Hood’s Bay and bought myself a certificate. I completed each day with a genuine sense of achievement and was so glad that I did it. It was probably the hardest walk thus far but I haven’t stop walking yet! My wife and I went to Land’s End for the first time in September 2011 and whilst there we visited the “End to End” story. As I looked at the exhibit, I took in the amazing journeys others had taken. I looked and wished that I had undertaken the journey when I was younger, lighter and fitter, but in the days that followed, I kept thinking about the possibility of still doing it, or at least having a go, and this is when the idea for my adventure began. I looked at the route and thought, given the right amount of dieting and training over the next 18 months; I could try and cycle from John O’Groats to Land’s Ends. As time went by, I thought that it would be nice to put a different slant on it and slowly the idea began to evolve of taking in the UK mainland four extreme compass points, Dunnet Head, Ardnamurchan Lighthouse, Lowestoft Ness and the Lizard, all sort of en route (Not). Fortunately or unfortunately, this idea seemed to grow and take on a life of its own: I would also visit the highest, (Ben Nevis - just because I was passing by) and lowest (Holme Fen); then the most central (Whalley – not including the islands) followed by the furthest point from the sea in any direction (Church Flatts). In conversation, someone suggested that I should really visit a geographical extreme where I live in Wales, so after a lot of searching, I chose the highest tidal flow in the UK which is along the Severn estuary. This latest extreme together with the other points, the furthest distance between to UK mainland settlements and the journey being against the prevailing wind meant I now had a journey with 10 geographical extremes on route and one to battle against, the prevailing wind, and boy at times it certainly was a battle. With all the extremes, the distance increased from the 874 miles to 1,500ish miles. To accomplish this, I allowed 35 days which included 4 rest days and a day to go up and down Ben Nevis, the highest extreme. To help with the planning, over the five day period of the Queen’s Golden Jubilee weekend, my wife and I drove the route and it was only then I realised the enormity of the challenge. In preparation, I lost 4 stones (1/2 of a hundredweight or approximately 25.5 kg), bought a bike and tried to get some in training on the hilly lanes of the Vale of Glamorgan. Unfortunately with the winter of 2012-13, I only really only got out on my bike from early March 2013, not ideal as I had planned to start my adventure on May 20th! However I did manage a dozen or so shorter training runs and three or four longer ones including a 56 mile trip from Brecon to Cardiff Bay along the Taff Trail. About two to three weeks prior to the start, I started getting problems with my left knee and not wanting to wimp out, as most of my friends and family thought I would, I managed to stock up on a carrier bag full of anti-inflammatory pills and painkillers from my GP which helped to keep me going throughout the journey. After 18 months of planning and over 100 telephone calls that my wife made to sort out my accommodation, I was ready. At the age of 62 at, 9 A.M. on the 20th May 2013, a grey and misty morning, I started my adventure from Dunnet Head and headed to John O’Groats and from there southwards, towards Land’s End my final destination, but with a few minor detours on route to take in the extreme points. Throughout my journey I had many low points, one of which was the weather: the battle against the wind, rain, hail and sub zero temperatures (yes even in late May) as I cycled down A9 alongside the Cromarty Firth, but that day dwindled into insignificance compared to getting up the morning after my 11.5 hour round trip to the summit of Ben Nevis! I staggered to the breakfast room on incredibly painful legs that felt like lead weights, in full knowledge of the 52 mile forthcoming long haul up and over Glencoe and Rannoch Moor on my bicycle. I could hardly walk and the only way to get on my bike was to stand on some steps to enable me to get my leg over the saddle. On the other hand, I had some fantastic experiences and highs and three of these really stand out. The first when I succeeded in cycling over Glencoe and Rannoch Moor to my destination after the experience of Ben Nevis the previous day. The second was in reaching the most Easterly point at Lowestoft Ness, which meant that when I turned around, I was at last heading in a westerly direction towards my last couple of extremes and Land's End. I had to wait until the end was in sight for the third high point, the icing on the cake. On arriving at the entrance to Land’s End, I was met by my eldest daughter (my youngest had cycled with me from The Lizard) and her husband along with their 3 children, my wonderful grandchildren, Hannah 6, Adam 4 and Tessa 3, all on bicycles to cycle the last 200m to the end of my amazing adventure. On completion of my journey, I went to see my consultant over my left knee, and had a half knee joint replaced. I now have two matching scars on my knees; my right knee was replaced in late 2009. I undertook the challenge not only for personal reasons, but, as I have worked in an industry closely aligned to road safety for almost 30 years, also to try to promote road safety within the UK. So the charity I chose to benefit from my challenge was Brake. I have raised just over £9,500 to help them carry out their vital work. Brake is an independent road safety charity which exists to reduce deaths and injuries on our roads and to provide support for families bereaved and people seriously injured in road crashes. It relies solely on donations from individuals and charitable grants. I attended the 2013 National Safer Roads Partnership Conference with my colleagues on behalf of Serco as an exhibitor. 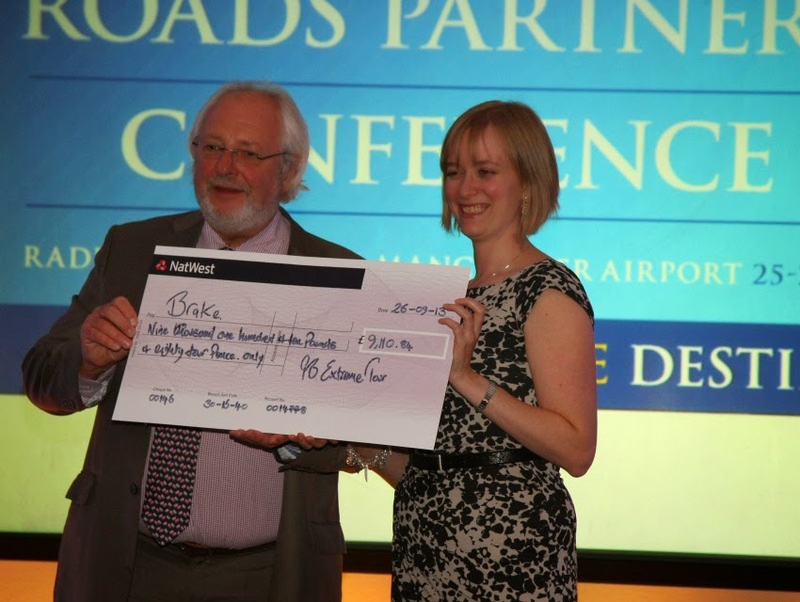 At the gala dinner, I presented Laura Woods, Research & Information Officer for Brake, with the ceremonial cheque for the monies raised by my GB Extreme Tour cycle challenge. To my complete surprise I was then presented with the first “Annual Road Safety Support Award for Individual Excellence in Promotion of Road Safety” by Meredydd Hughes CBE, Executive Chairman Of Road Safety Support Ltd.
Editor: Congratulations to Graham, for both well-deserved awards, and for sticking with what sounds like a gruelling journey, to the end. Having enjoyed previous long-distance rides in the company of fellow NACC (National Autocycle & Cyclemotor Club) members in 2010 — Lowestoft to St. David’s Head, Wales, and 2012 — Land’s End to Lowestoft; l fancied doing something as far as feasibly possible independently. LeJog was an obvious target but I put it to the back of my mind until towards the end of 2012 when I heard of the untimely death of a good friend of mine who I raced with in the 1990s during my time as a Sidecar Grasstrack driver. Kevin was only 58 and as I myself was now the wrong side of 50 I decided if I was going to be able to cross this idea off my “bucket list” (who on earth came up with such a daft concept?) I had better do something about it soon. I discussed the idea with my good friend Roland Scarce — who conveniently happens to own a nice Ford Transit van — and he said that he would willingly transport both me and my machine down to Land’s End, meet me at designated points along the route, and best of all bring me back home from John O’Groats. However he said that the trip would have to be done during his two weeks’ summer leave from the school where he works. Conveniently this coincided with the date of the NACC National Rally which is held in July so this would make a nice overnight stop for us on the trip. Now I had to sort out a route. Previously we used Travelodges for our long-distance runs; they are convenient, offer good facilities and are reasonably priced, so I decided that these would be my first choice. Early in 2013 Barclays wrote to me saying that I would be getting a PPI [Payment Protection Insurance] refund. A few days later I had quite a substantial sum deposited into my bank account, I paid off my Income Tax bill, and started searching for Travelodge rooms! By booking well ahead you can get some incredibly good rates, so after studying a map of Travelodge locations I booked rooms for myself and Roly — it was a once in a lifetime adventure so we might as well make it as comfortable as possible — at: Barnstaple in Devon, Stonehouse in Gloucestershire, Preston in Lancashire, Carlisle in Cumbria, Dundee and Inverness in Scotland and also at Hayle in Cornwall which was the nearest to the Land’s End start point. I figured that I could do the ride in eight days so thanks to Barclays Bank we had accommodation booked from July 17th —24th. I would either camp or stay with friends at the NACC rally which is held near Wolverhampton. Now what machine to use? I have a good stable of 50cc machines; I also have a 31cc Cyclaid attachment on a BSA Cycle and a 11OOcc Honda. One would be too exhausting, the other far too easy so these two were quickly eliminated. For me there was only ever going to be one choice — my 1973 Honda PC50K1 fitted with my self-designed and built Sidecar, combining my love of mopeds and sidecars. This is my favourite machine, and as an added bonus is comfortable to ride. I used this on the 2010 Side to Side Run and also on the 2012 L to L run (although I was persuaded to remove the sidecar by the other riders for the 2012 ride! ); so I knew it was as reliable as a 40 year old moped could ever be. I researched the choice of vehicles used on previous End-to-End runs and couldn’t find that anyone had attempted the ride on a moped with sidecar previously so if I completed the ride I could create some sort of record albeit very minor and insignificant. Although it would have been nice to use similar roads to the other two runs — mainly B roads and cycle routes — this wasn’t really an option as I would have to cover many more miles per day owing to the longer distance and short time period I had allowed to complete the run. So by and large, my chosen route took me on A roads although sometimes it was possible to utilize B roads where they run virtually alongside the direct route, and/or they provided a convenient short cut. My machine is well-travelled and has never given major problems so my preparation was limited to “freshening up” the engine with new piston rings, contact points, and general servicing. I fitted new wheel bearings in all three wheels, new tyres and tubes on the front & rear wheels, new chain and sprockets. I fitted some extra cycle LED lights front and rear, extra reflectors to make me and the machine more conspicuous; I also fitted a Sat-Nav Holder and a 12 volt battery in case my route planning went astray! I always carry spare Inner Tubes, Tools, Oil and spare Petrol so there was no extra preparation there, the only things to carry either in my pannier bag or on the sidecar platform was waterproof riding gear and “Mike the Meerkat” who my Niece Freya, visiting from her home in America, insisted came along for the ride! July was soon upon us. Roly pulled up in my drive to load everything into his van that we would need for the next nine to ten days we'd be away from home. In went my machine, together with a spare Honda moped (if for some reason my sidecar outfit had a terminal failure, hopefully I could complete the run, albeit on a solo machine). Roly’s machine was already loaded as he would be using it at the NACC Rally weekend. I had prepared spare wheels, engines and other associated parts that I packed as “insurance” — no good having the spares if they are hundreds of miles away at home! Clothing, tools etc. were also packed neatly around the bikes. After a hearty breakfast we set off to travel to our overnight stop at Hayle, Cornwall in readiness for an early start the following day. 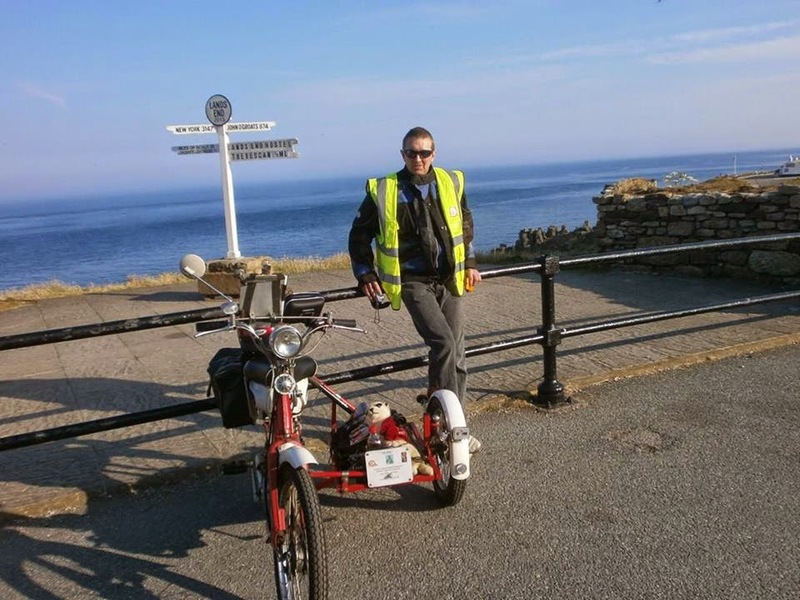 Carl Squirrell at Land's End, the start of the 8-day challenge. 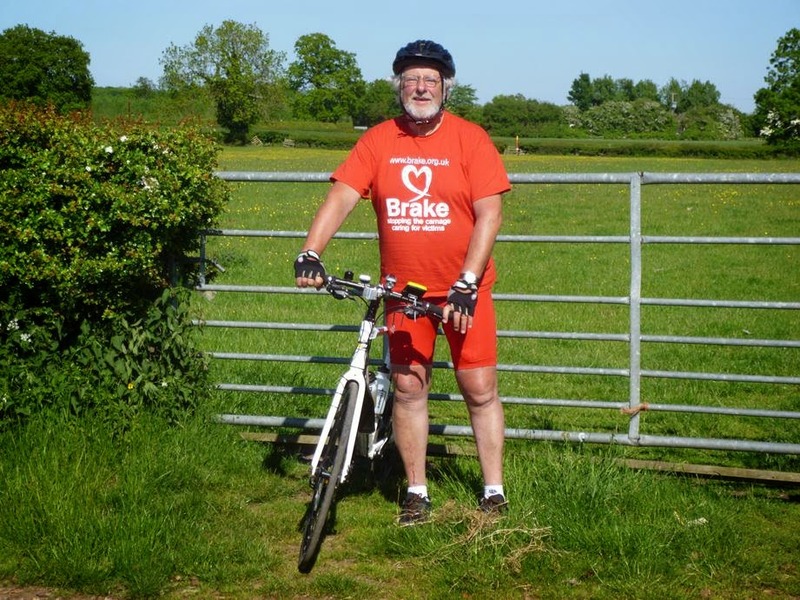 Day 1: 18th July, Land's End to Barnstaple, 137 miles. We unloaded at a deserted Land’s End. With no official photographer on site at that hour, I had a photo at the sign taken by back-up driver Roly. After getting my sheet signed at the Hotel, I set off at 8 o’clock with some trepidation on my ride of a lifetime. This part of the route was familiar to me as I had ridden it less than 12 months previously, but then I was following Dave Wickens and didn’t really pay much attention! However, I found my way, and soon remembered the hills we struggled with last year. I then diverted onto the notoriously bad A30 for a few miles. In my haste to leave this road, I turned off too early, came back through Redruth and had to ride the same bit again! I then joined a very nice cycle route to Columb Major before joining the not-too-busy A39 to my first overnight stop at Barnstaple where I arrived at 3.30pm. A good start to my ride with no machine problems. The weather was very hot though. Day 2: 19th July, Barnstaple to Stonehouse (Nr Stroud), 140 miles. I set off at 6 o'clock for two reasons: the forecast was for very hot weather, and I planned to get to Stonehouse early as Roly was heading off to the NACC rally that afternoon and I wanted to shower, do my website & Facebook reports and put my gear in the van before he left. It was lovely riding in the cool morning air and, unlike last year, it was dry! By 8.45 I had crossed another border into Somerset and stopped off at Glastonbury for breakfast. I sorted the Speedo which had become very noisy, and carried on across the Somerset levels. At Wells I changed course from last year and continued on the A39 — last year we got lost in Wells and everyone bar me wanted to take this direct route to Bath. Well, boys, you can thank me for sticking to my guns! This road had hills which went on and on. Eventually I pulled in and lowered the gearing; this helped, but it was still a struggle. Eventually I got through the worst, and on the outskirts of Bristol I phoned Roly. He was some way behind me so we arranged that he would leapfrog me on the bigger roads and we'd meet at Stonehouse. The rest of the day went smoothly and I arrived at 2.30 to Roly waiting for me. I did my reports, checked over the bike, showered and left Roly to face the Friday afternoon traffic on his way to the NACC National Rally at Wolverhampton. Another satisfactory day, and two shorter days to look forward to. 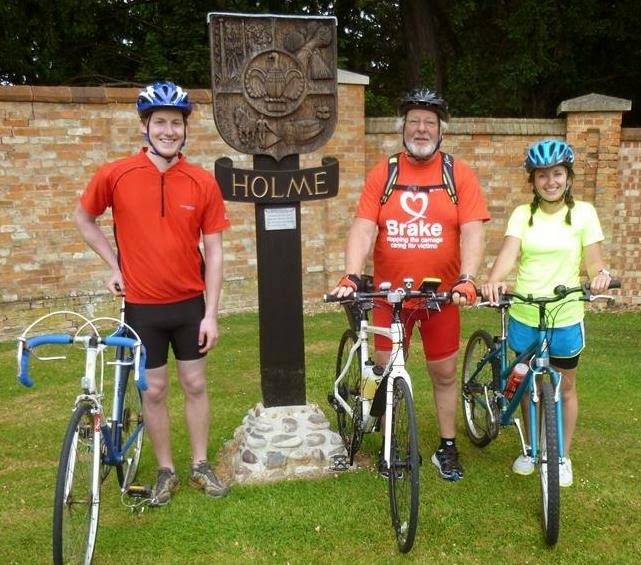 Day 3: 20th July, Stonehouse to NACC National Rally, 89 miles. After a disturbed night's sleep (I was warned on the Travelodge website) not helped by the hot weather, I again set off at 6 o'clock with the hope of arriving at Wolverhampton Rugby Club in time to join in with the Saturday Road Run. A wrong turn meant I did more miles on the A46 than I intended but soon I had reached Cheltenham racecourse. I then stopped off at Ecklington, bought some postcards and had an interesting chat with the shopkeeper. Nice quiet roads led me to Pershore where I refuelled, and soon I had reached Kidderminster. Things were looking good for an early arrival at the rally but then things went a bit astray and I had to resort to plugging in the SatNav. I programmed it wrong and soon realised it was sending me back to Kidderminster, so I reprogrammed it and it led me directly to the Rally site up some narrow and very hilly roads. I was too late for the run but Reg and Denise Jones looked after me and allowed me to use their Caravan as my “office” to do my reports. I changed the oil and checked the tappets and timing on the bike, before showering and enjoying the meal and entertainment provided by the South Staffs Section. No Travelodge (or tent) tonight, as Bob and Liz kindly put me up at their house. It was a good day, but I was disappointed not to be able to join in with the run on the East Coast Pedalers “Track Spare” Honda Novio which was in the back of the van. Day 4: 21st July, NACC National Rally to Preston, 116 miles. This was latest start so far: 10am, as I set off on the Sunday run with everyone else before heading off on the “Rabbit Run” to Telford. Then I took a few (planned) deviations on minor roads before rejoining the A49 to Whitchurch — happy memories for me here, as it was where in 1990 I won my one-and-only British Sidecar Grasstrack Championship — then to Warrington and Wigan. Once I crossed the border into Lancashire it began to dawn on me just how far I and my little machine had travelled in just a few days. With my machine celebrating its 40th birthday this year, and me having passed my half-century 18 months previously, it didn't seem a bad few days for a couple of old-timers! I must have been reflecting on this as I sailed straight past the Travelodge on the outskirts of Preston where Roly was waiting in the car-park, looking forward to sleeping in a proper bed after two nights of roughing it in the back of his van. As a thank you for all his good work so far I treated him to a meal in the local pub down the road — it was a “two for one deal night,” but l didn't tell him that! Day 5: 22nd July, Preston to Carlisle, 99 miles. It was easy routing today: straight out of the Travelodge and follow the A6 to Carlisle — that was the plan anyway! I set off at 7 o'clock, got through the Preston roundabouts and traffic lights with no problems, and took a planned diversion through Garstang where I stopped to stock up on Fruit and Breakfast bars. Monday morning traffic was busy through Lancaster; once through this I phoned NACC member Dennis Gallyer whom I had arranged to meet in Kendall. He advised me of a better route to Kendall and I rang Roly to inform him of the change of plan. He later met me along this route, and we had our first scary moment of the trip when he drove off with the van side-door open! With visions of me arriving in Carlisle loaded up with toolboxes, kit bags, spare wheels etc., I frantically tried to phone him. Fortunately he realised a couple of miles up the road, and as he stopped in a layby, the door shut of its own accord. Dennis spotted me checking directions on my road atlas, and after we introduced ourselves he led me to Kendall, where we met up with Roly and had breakfast together. I decided to fit my spare rear wheel with a bigger sprocket as we were then to tackle the infamous Shap climb. On removing the standard wheel, I noticed a broken spoke — someone was really looking after me on this trip. As Dennis was going to lead me straight to Carlisle we decided Roly could have an early finish and motorway it straight there. Dennis and his Yamaha led me out of Kendall- with 250cc under him he was never going to struggle, but I soon lost momentum and so pulled into a lay by to fit my smallest front sprocket. As I was doing this a group of Honda step-through riders came thundering down Shap, all with big grins on their faces. This gave me a well-needed boost and soon we had reached the summit. From there we had a straightforward run to Penrith where we stopped for a drink and chat before we carried on to Carlisle where Dennis led me straight to the Travelodge. Here we chatted to a bemused local for some time, who was amazed to think we would chose to stop in his hometown. I thanked Dennis for his company and help and bade him a fond farewell before checking over the bike in preparation for tomorrow’s ride into Scotland. A couple of interested youngsters wanted to try out my bike — No way, boys! — but I satisfied their curiosity by demonstrating some two-wheel sidecar riding around the car park before loading the bike back into the van for the night in the hope it would still be there in the morning! Day 6: 23rd July, Carlisle to Dundee, 177 miles. I knew I was in for a very long day so set off at 6am. Thanks to advice given to me by a new-found friend we met yesterday, I got through Carlisle with no problems and was soon heading up the A7 towards the border. In no time at all I was in Scotland and took a few moments to reflect on the journey so far. Soon after, I turned off onto to a very minor road with absolutely no-one on it at all; the only company was a few sheep. The road was very narrow and dropped off steeply at the sides! I did feel a bit vulnerable for a couple of hours. The weather was a bit drizzly, but PC50 engines excel in these conditions and my little machine pulled me up all the hills with no problems. Eventually I saw some signs and headed off to my rendezvous with Roly at Peebles. Roly had found a superb stop at a very scenic car park, complete with an excellent snack van which provided me with a top class Egg & Bacon Burger and a welcome steaming mug of tea. I reverted to standard gearing and set off ready to face my next challenge: the Forth Road Bridge. I enjoyed a great ride on mainly traffic-free roads. Skirting Edinburgh I met Roly just before the bridge and he followed me across with hazard lights flashing to warn other bridge users that there was an underpowered lunatic ahead! I was grateful for this as it was rather drizzly and windy up on the bridge and the traffic was travelling at rather more than the 50mph limit. Soon after the bridge I said goodbye to Roly as he was going on a different route to Dundee. I stopped off in Inverkeithing to get my log sheet stamped at the Post Office. The Postmaster was reluctant to do this — he said it wasn’t allowed. No other Postmaster had shown any reluctance. Eventually he did give me the required stamp and as was my normal practice I did put something in a charity box on the counter. I then continued on my chosen route to Dundee with no problems. Another bridge to cross: the Tay Bridge, and Dundee was in sight. I had a big problem finding the Travelodge, not helped by the SatNav becoming unplugged crossing the bridge. Eventually I enlisted the help of a local who directed me there but not before I had to get off and push the outfit up a series of incredibly steep hills! I arrived at 5pm after a very long day, but not as bad as I expected it to be. NACC member Neville and his family came over to join us for a few drinks. 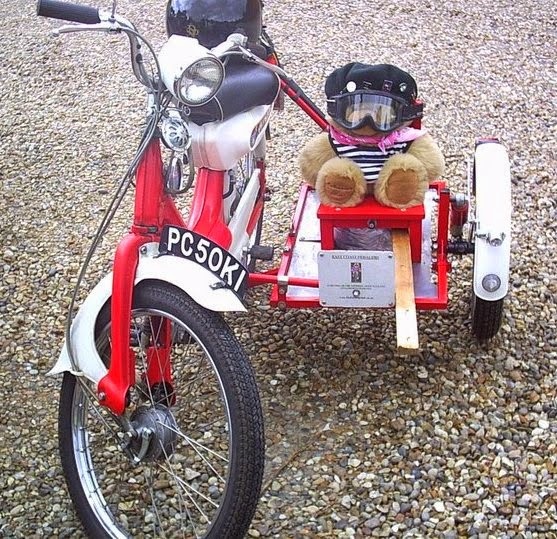 Amazingly he wants to build a sidecar similar to mine as well, fool! As time was getting on we elected to eat at the Travelodge but wished we hadn't! Day 7: 24th July, Dundee to Inverness, 182 miles. Once again I knew I was on for a very long day, so at 6.30am I set off in full waterproofs. My plan was to set off on the A90 and then turn off on some minor roads, but visibility was poor and I felt safer on the bigger roads so elected to stay on the A90. I followed it to Stonehaven, which is the birthplace of Robert Thomsen the inventor of the Pneumatic Tyre. It's a great invention and one which has made this trip much more bearable; plus, so far I haven’t even had a puncture! Roly was waiting for me opposite a petrol station. I pulled onto the forecourt to refuel and just as I did the heavens opened and in no time at all the road was under inches of water! I paid for my fuel and after speaking to the cashier, decided to fit my lowest gearing as there was a steep climb out of the town. She assured me that my chosen route across the Correen hills would be OK though. Once I had carried out my gearing changes, the rain had stopped and the sun was out, so once again luck was with me. This part of the route was great, very scenic and on traffic free roads. I met Roly again and went up a tooth on the drive sprocket. I arranged to reach Roly once more, but time was running away. All too soon it was lunch time and hunger got the better of me so I stopped in Dufftown. I rang Roly and he was only 3 miles up the road doing the same! We decided then to meet up in Elgin; I carried on for a couple of hours and soon the signs for Elgin appeared. There were many unplanned diversions due to roadworks, but I got through and out of Elgin with no problems but never saw Roly. I rang him and he was parked at a junction where I somehow missed him. He carried on and overtook me further up the road and pulled into the next lay-by. I refuelled from the van, grabbed an apple, and as we were only now 25 miles from lnverness instructed him to head straight for the Travelodge and check us in. 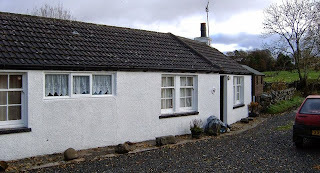 My ride went smoothly: I turned off the A96 and went onto to the B9006 past Culloden Moor battlefield and arrived at the Travelodge at about 4.00pm — Roly had only been there about half an hour as, in a reversal of fortunes, he had suffered SatNav problems. The last day: 25th July, Inverness to John O'Groats, 117 miles. I thought I might split this leg over two days but having under-estimated the distance of the last two days, 120 miles or so should be a walk in the park! There were only two roads to follow, the A9 & A99. I had a 7 o'clock start in dry conditions, but it soon became obvious that my waterproof oversuit on the rear carrier would be needed. After 23 miles Roly caught up and pulled over. I pulled on the waterproofs and carried on. All too soon the hills I was fearing appeared. On the first long one I passed a couple of fellow “End-to-Enders” on cycles, but then I had to stop and lower the gearing for the final time. They overtook me as I was doing this and gave me encouragement. I then got going again and managed to get past them and returned the encouragement they gave to me previously. Fortunately I gained enough of an advance that they didn’t see me pushing up to Caithness! By now I was high up and visibility was very poor; for the first time I started to feel cold and the PC50 engine had lost its edge a bit. I suspect the ignition timing had retarded a little but I wasn’t about to try to alter things with just a few miles to go, so the motor plodded on. In my mind I must have already been at John O’Groats, as I ran out of petrol for the only time; fortunately I had my reserve can on the sidecar so this was easily rectified. I met Roly once more before pushing on the last few miles through the gloom of North Scotland and before I realised, I was riding through Wick and saw the signs to John O’Groats. A bus-load of tourists waved encouragement from their coach; I was later informed that the driver made some funny remark about my machine. I was soon there, arriving at 1.30pm. John O’Groats is not exactly high class but there were lots of people around including a group of "proper" bikers who couldn't believe what I had done on my machine. I flashed the cash and had an official photo taken at the sign, and a freelance photographer also took a load of pictures. We then had some overpriced refreshments in the restaurant, bought some overpriced nick-nacks from the shop, and spoke to & had photos taken with several holidaymakers. I had planned to carry on to Dunnett Head but abandoned this plan as it was rather cold and wet by this point, so we loaded up and headed back in the hope of reaching my friend’s home in Penrith where we had planned to stay the night. We abandoned this plan and instead managed to get a room at a Glasgow Travelodge instead. It was a trouble-free ride and far, far easier than I ever expected it to be. I'm absolutely stunned by the reliability of the Honda PC50 — Mr Honda would have been proud — and even more amazed that my self-designed and home-built sidecar went the distance! It's an ambition achieved, thanks to Roly giving up his time to support me on this trip. (If there is a record for the longest time taken to do LeJog in a Ford Transit van he would qualify!) My route was based around Travelodge locations — without exception the staff were fantastic and we couldn’t have asked for better. My thanks to Bob and Liz for putting me up on the Saturday night and to the Staffs Section for such a great weekend, not just for myself but for everyone else there. Thanks to Dennis and Neville for their company on a couple of days and to all the NACC members who offered assistance had I needed it when passing near their homes. And lastly, thank you to my loving partner Debbie who issued me with an extended “Kitchen Pass” to enable me to do the run, and booked us into the Glasgow Travelodge whilst we were driving back. Having done Up and Down — Land’s End to John O’Groats — and the Side to Side (the long one) — Lowestoft to St Davids — with the Sidecar, my last drive before it goes into semi-retirement is likely to be the Coast to Coast — Hartlepool to Whitehaven. In my own unique way, it will probably be over 2 days. Day I: Hartlepool, Whitehaven, Alston. Day 2: Alston, Hartlepool. The Butterwick Hospice advertised in our local gazette for volunteers for a sponsored go-kart endurance race in February 2012, so I thought it would be a good idea to make up a team of geriatrics, the youngest being a mere slip of a lad of 65, the other three being 70. We named our team the “Petrolhead Pensioners”. After a postponement due to icy conditions on the track it was rearranged for 16th March. On the night, the Petrolhead Pensioners arrived at the circuit suitably equipped with walking sticks. Little did I know at the time this was tempting fate. After a safety talk it was off to the start of a 20 minute practice. When you leave the pits, you are supposed to follow the track to the left; unfortunately a couple of drivers had not been paying attention and cut out right. If a marshal had not run out and turned them around, there would have been a head-on crash. “Young” Ron was first out, but after one lap he was back in the pits looking very shaken. Ron has pretty poor eyesight at the best of times but due to the circuit having floodlights only on the outside of the circuit, he had great difficulty picking out the corners on the inner parts. Being the team leader (well, it was my idea), I suggested in the interests of safety that Ron would act as our pit board marshal. We were now down to three drivers who were due to change every 12 to 15 laps. My old mate Geoff Bowman had twisted his ankle a few days earlier and was very dodgy on his travelling gear, his legs, so I suggested he stand down after 45 minutes. This left Bob and me to carry the flag. Five minutes later, Bob took a nasty shunt and damaged his ribs, and then there was one. With only 25 minutes to go, I felt fit enough to stay on track for the remainder of the race. There was one driver whom nobody was able to catch; it turned out he was the UK and Lemans endurance champion. He thought there was prize money at stake, and was most annoyed when Laura the organiser informed him it would cost £10 per team member, plus every driver must raise at least £40. I don’t know if this put him in a bad mood, but he wiped the floor with the rest of us. By now the PPs were at the bottom of the board, as it had taken 5 minutes to get Geoff in and out of the kart at every one of his pit stops. I decided to try and keep up with the faster drivers and was doing quite well until I was on the back straight going flat out when this kart overtook me and cut across my racing line. I learned that one from watching F1 on TV. At the safety talk we were told all the karts were equal but it was obvious that some were faster than others. The kart that passed me was, I think, driven by a female. This was adding to my frustration, and I gave chase through a series of tight bends until I came to the tightest hairpin on the track. Every time I came to this point I had used the grass to go around; this time three karts had slowed down and were spread out with no way through. I clipped one kart, and then some idiot rear-ended me, propelling me into the safety barrier. I must have still been doing about 40 mph when I hit it head on. There were two rows of tyres in front, but they did nothing to slow me down. I could not move my right arm without it causing me great pain. No, I did not cry; what a brave lad I was! As instructed, I sat in the kart and raised my left arm to show I was in trouble. In a few seconds a marshal (or he may have been a sheriff, ha ha), came running over and asked if I was ok. Was this bloke for real? I was sitting in a kart that by now had almost no steering gear that wasn't twisted, and I was in a world of pain. No, I was not ok! My main concern was the fact that our kart had been running for over one hour and the exhaust was still very hot. If the crash had fractured a fuel line, I could be barbecued very well done. When his mate arrived, he asked me the same stupid questions. I assured Theresa that there was nothing broken. They then said they had called an ambulance, but if it couldn't make it quickly enough they would call in the air ambulance. Great! I may get a lift in a helicopter. When the paramedics arrived, they checked me over again and then loaded me and Theresa into the “meat wagon” and off we went to the James Cook hospital. I got talking to the paramedic, who informed me they were called out to that track every week and there had been two fatalities. Nobody mentioned this fact when I volunteered! In the waiting room there was a strange collection of people: one was handcuffed to a policeman who looked a very unsavoury character. The prisoner looked dodgy as well. When my name was called they wheeled me in for inspection. The most painful part was getting me out of the overalls, but after a lot of screaming (again, I did not cry), I was down to my underwear and off for an x-ray. Now, I have been x-rayed many times but this guy covered everything, and I mean everything. I must have been in there well over half an hour. When they had finished with me, Theresa and Bob wheeled me back to the cubicle. I must explain at this point that neither Theresa nor Bob have any sense of direction, and as Bob suffers from short-term memory loss, it took three attempts to finally find the right cubicle. While I was waiting for the results, they wheeled in a speedway rider from the same venue as me. Theresa got chatting to him and found out he was from Prague. Suddenly I was forgotten, but only for a few minutes... Again, I did not cry! What a brave lad I was. The doctor popped his head round the corner to inform me that there was nothing broken. I turned to Theresa with a rather smug look on my face that said “I told you so.” He asked if I needed anything so I asked for a pair of crutches, as I was determined to make it to the club on Saturday night. Bob and Val, who had been great with me all night, brought the car almost to the door and after a great deal of bad language, managed to get me into the car and home. Getting out at the other end was a different kettle of fish; once out, I tried to get moving, but the stupid crutches refused to work. Val suggested that I try to hop on my good leg. Theresa looked her in the eye and said, “Val, 70 year old men do not hop even when not injured!” I am afraid I did cry, but it was with laughing so much. With all the laughter and screaming going on, it was a wonder all the road was not out, bearing in mind it was now 0030hrs. 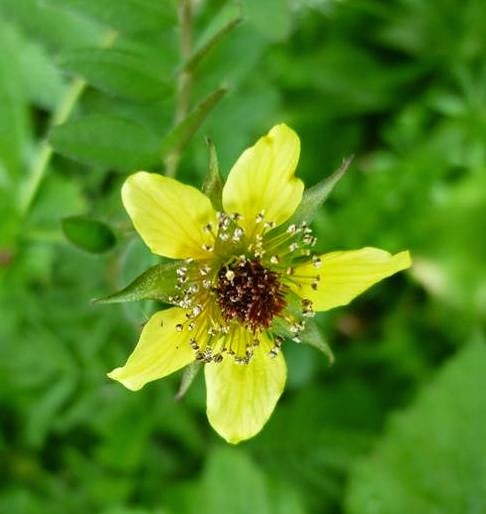 The next problem was the stairs: with advice coming from three directions, I disconnected my hearing aids and after half an hour managed to get upstairs on my backside and drag myself into the bedroom. Bob undressed me — Yes, I made sure the curtains were closed — and left me in Theresa’s capable hands. I spent the next three days in bed with Nurse Theresa tending to my every need. Though we did not win a team trophy, I did receive a trophy from my mate Gary announcing me as “The Crash-Kart King.” According to Gary, my team was not the slowest on the circuit: the ambulance was slower by a few seconds. Ha bloody ha. After three days, I was getting stir crazy so I got Theresa to bring in an office chair on casters. This gave me more freedom and I could manage to get myself into the bathroom using my crutches as a propellant. It was another couple of days before I was able to use the crutches, and then I was up and running. Well, not quite running. The next step was to manage the stairs. This I had to do while Theresa was downstairs as she had strictly banned this manoeuvre. She went ballistic when she caught me half way down. Nine days after the accident I staggered into the club on my crutches feeling very conspicuous, but after a few rums I felt a lot less so going home. The next day was the day I was waiting for: after a lot of pain, I managed to get back behind the wheel of my new car. Six weeks after the accident, I was still in pain from my shoulder, and waiting for an appointment with a specialist for some injections. As it happened, the injections did me no good as it was the capsular that had partially seized up, so an operation was necessary. My specialist passed me on to Professor Rangan. According to my GP he was sympathetic to older patients when other surgeons were loathe to take them on due to the failure rate. After an interview, the Prof decided to take me on and I was admitted into the private Nuffield hospital. The operation was a success, but the physiotherapy was a nightmare, my “physioterrorist” as I called her was a pretty young lass called Jonquil, and she proceeded to put me through two months of hell. I am glad to say it worked out very well. Was it worth it? I think so, but I must stop my brain writing out cheques my body cannot pay. I wrote a letter to the company who own the circuit but it was like talking to the village idiot who had loaned out his one brain cell. When I brought up the subject of the lack of lighting and bad marking on the corners the representative said he walked the course prior to every meeting to check everything is safe. I pointed out there is a world of difference between walking the course and driving it at 60 mph. I again broached the subject of the bad marking of the corners but he said they were painted every year! After half an hour of trying to get any sense out of him I was rapidly losing the will to live and terminated the conversation. On a brighter note, the event looks likely to raise over £3000 for our local Butterwick Hospice, so yes, it was worth it, despite all the pain! Five members made a guess at the location of my photograph on our Spring Issue cover. I must confess that until a few weeks ago, it was a mystery even to me. I chose it for its design merit and didn't work out where I was until the time came to reveal the answer here. 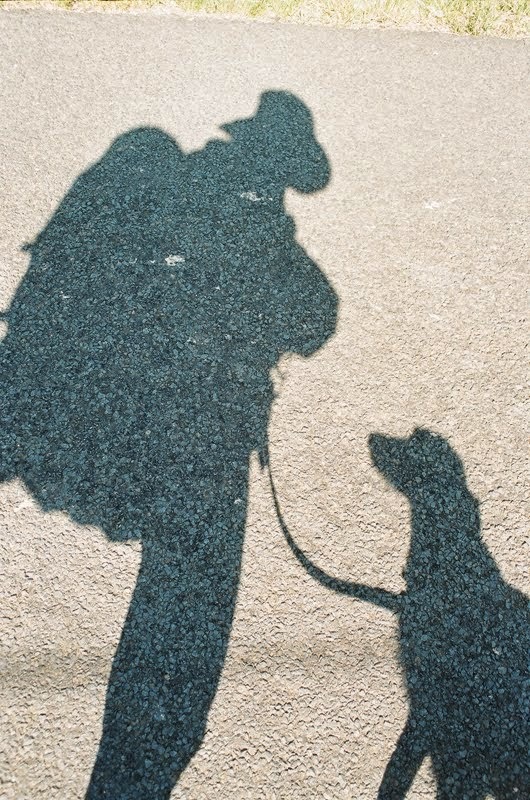 I walked LEJOG in 2007, unplugged, (meaning: I didn't blog, Facebook or Twitter my progress); I was also retro enough to still be using a film camera, so I had no GPS record from a nifty digital machine. However, thanks to a good old-fashioned pencil and notebook, I could look up, 7 years later, that I took the photo on 26th May between Carlops and Balerno, just south of Edinburgh. This route takes you through the Pentland Hills Regional Park, and if walking north, the scene is somewhere beyond North Esk Reservoir. I used the mostly off-road route of Andrew McCloy as described in his book, The Land's End to John O'Groats Walk: A Guide to Planning the Ultimate Footpath Walking Adventure. I think it might be in Cumbria (Lake District). Anyway, wherever, it’s an attractive picture. 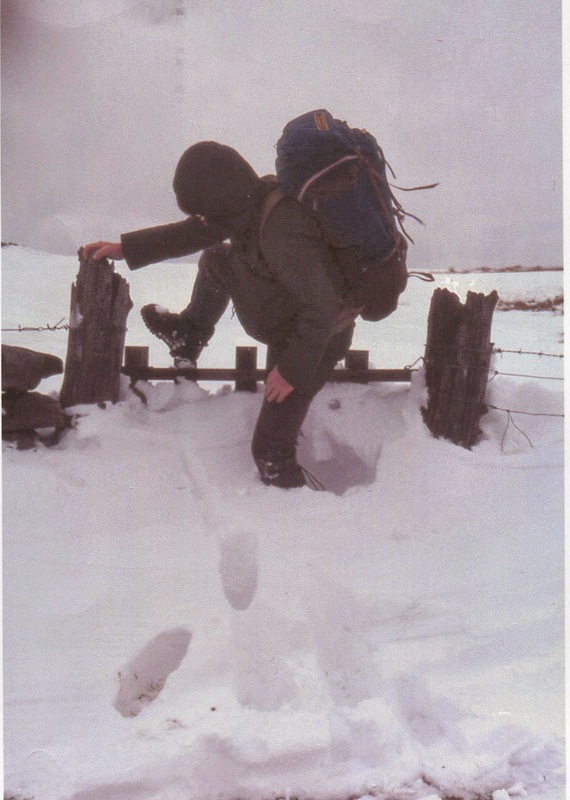 I'm going to guess that the photo was taken somewhere on the Pennine Way, which is rather a vague answer as the Pennine Way is more than 200 miles long. Oh well, at least I tried! I do not know where you took the picture but I have seen similar views in Northumbria and elsewhere. As soon as I saw it I though 'that's Northumberland'. I may be wrong but when I re-read your report on your walk and saw that you used Hamish Brown's book - and my book, One Woman's Walk (thanks for that!) I guessed you must have gone that way through the Cheviots. I don't think many cyclists are going to use that route! As I say, I may be wrong but I'm thinking it may be taken somewhere in the Coquet area or near Woden Hill Fort. I have gazed at the cover picture, studied Wainwright and looked through my pictures of our walk. The conclusion is, I haven't a clue. But I will have a couple of guesses: between Baldersdale & Middleton, or: near Gargrave. When we walked the Pennine Way we had beautiful weather until we reached Horton In Ribblesdale. 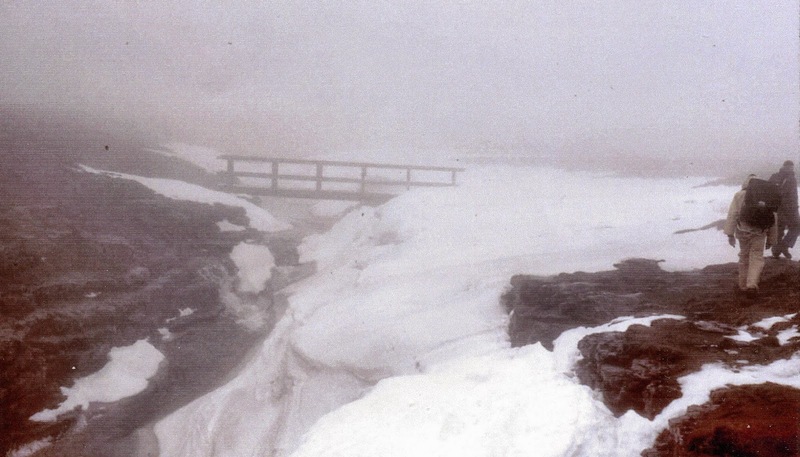 We arrived in a heat-wave, but the next morning we awakened to a blizzard. Not to be deterred, we set off across the moors (we were made of 'stern stuff') which was foolish, but we did survive obviously. The bad weather continued until Alston. 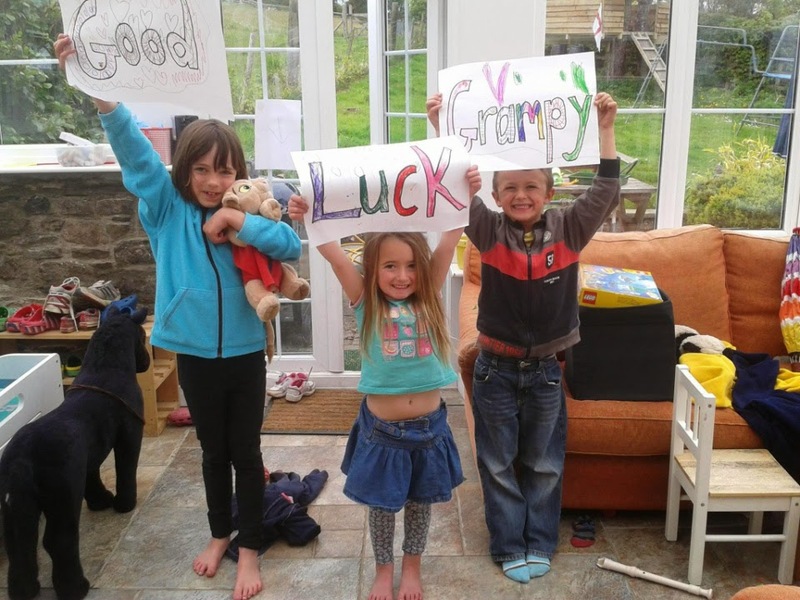 Owing to a training injury, Eddie did his slowest ever time – 5hrs 41mins 9 secs – but has raised so far £1748.55 for MacMillan Cancer Support and anticipates he will finish up with about £2000. He has already booked his place for next year’s event. 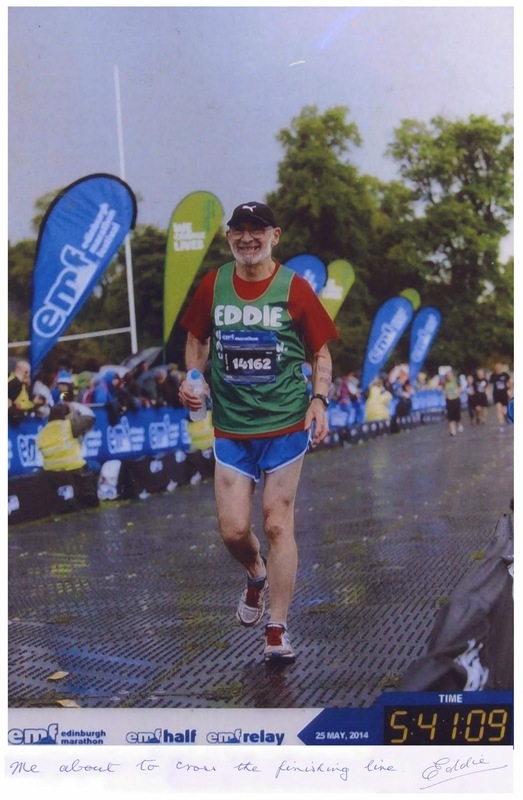 When I wrote and asked Eddie for a photograph from his run, he replied that he wouldn't attempt to attach it to an email message, but would send it via airmail. 8 days later, it arrived in South Africa, neatly wrapped up in card. Thank you, Eddie, for going to the trouble! And congratulations on your run. Your smile says it all!